London brewery Deviant & Dandy and brand agency BMB have teamed up to create a new beer designed to complement the flavour of British nut brand KP. The beer – called KPA – is a light hoppy pale ale which has “subtle hints of oats and a citrus punch,” according to the brewery. Developed by Deviant & Dandy founder Byron Knight alongside head brewer Paul Bogan, the beer can be purchased on the brewer’s website. The launch will be promoted via a series of online video content created by BMB which will run on social media. Knight is the co-founder of Beavertown alongside Logan Plant, but left the brewer in 2013 to pursue other projects. Bogan meanwhile moved to Deviant this year, joining from Camden Town Brewery where he was lead brewer. Jess Templeton, senior brand manager at KP Nuts said: “We’re always talking about synergies, but BMB’s suggestion to pair KP Nuts with a tailor-made beer was an instant, no-brainer – yes please. 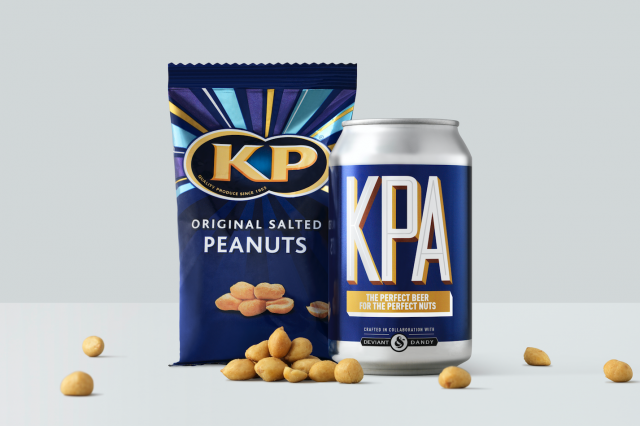 We think our fans are going to love trying the KPA with KP Nuts and we can’t wait to see the feedback on social media”. Byron Knight, founder and director of Deviant & Dandy, said: “This was a super fun project to work on. As beer lovers ourselves we have, of course, eaten more than a few KP Nuts in our time, so getting to work with the brand alongside BMB to create The KPA was right up our street”. Deviant & Dandy is selling the 4.5% ABV pale ale in 330ml cans, with a four-pack and a 415g pack of sharing nuts available for £10. According to recent study commissioned by St Austell Brewery which revealed ‘the perfect formula for a pint’, 65% of those surveyed said that the food accompanying the beer was crucial to its enjoyment. Among the favoured dishes or snacks to accompany a pint were crisps, curry, a burger and peanuts.